Whilst researching the King’s Oven page it became clear that within the locality were a large number of cairns and other prehistoric ritual features. For Dartmoor this is nothing out of the norm but one name seemed to jump out from the map – Asacombe Hill. The name alone boggles the mind which prompted a quick scan through the ‘Place-Names of Devon’ book which turned up a surprise in itself. One would have thought that the first name – Asacombe, had derived from a personal element, namely Assa and a descriptive element, combe, thus giving ‘the combe or valley of Assa’. But no, the English Place-Name Society suggest it’s more straightforward than that, the name first appears in a document belonging to the Duchy of Cornwall dated 1488 where it appears as Assecomb. This, the experts tell us, probably means the ‘asses combe’ or in other words the combe or valley where the asses graze, (Glover et al. 1992, p.198). This in itself poses a question, Dartmoor is and has been for a long time noted for its ponies who, for centuries, have been used as the powerhouses of the moor. So why would anyone need to keep and/or graze anything from the Equus species anywhere on the moorland commons apart from the ponies? Delving a little deeper into the tomes of Dartmoor one soon arrives at Hemery’s ‘High Dartmoor’ and here he clear states that: ‘Any idea, based on the spellings ‘Assaycombe’ and ‘Assacombe’ found commonly in books and maps, that the valley was once the combe of the asses can be dismissed, for the Dartmoor pronunciation is consistently ‘Asacombe’, the spelling ‘Asacombe appearing without variation on early maps – including the Tithes Map of 1843‘, (p.747). So maybe the original idea of it meaning ‘the combe of Asa or Assa’ may be correct? Provided all these huts were permanent dwellings (as opposed to those used seasonally during transhumance) it could be estimated that the settlements supported a population of about 150 people. This is based on Butler’s theory that the larger huts of over 7m diameter would accommodate four adults and those below this size probably were designed for two adults to live comfortably, (Butler, 1997, pp.140 – 1). Burl, (2000, p.152) suggests an alternative theory based on, ‘allowing 2½ acres (1 hectare) per person for sustenance’ , this is excluding any fallow land or that unsuitable for cultivation. The settlement area around Asacombe is about 13 square kilometres which equates to roughly 1,300 hectares thus giving a population based on this idea of 130 people, which is not far away from Butler’s figure of 150. It is interesting to note that all 3 settlements are located on hillsides with Hemstone and Lowton on the south-eastern and eastern slopes which would have been sheltered from the prevailing south westerly weather. However, Asacombe is facing directly into the oncoming winds and rain and is situated slightly lower down the slope than the other two settlements. All 3 settlements are situated near to water courses which is nothing astounding. But are there any other marked differences? To answer this question it would be helpful to examine each one by locating those hut circles listed by English Heritage and then plotting them on the OS map. Additionally, working on Butler’s theory what does the hut sizes tell us? There are two obvious factors here, firstly it is noticeable how close together the hut circles are and secondly how small they would have been. The mean internal diameter of the group is a mere 4.02 metres which one could hardly call spacious. Working on Butler’s theory, as all the huts have a diameter of less than 7 metres which would mean that only two adults could comfortable live in each one, this would therefore give a total adult population of 14 for the settlement. This would be assuming they were all inhabited at the same time and that no other huts have been lost to later ‘recycling’ or damage. The nearest known ritual monument in the form of Fernworthy stone circle and rows is just about 700 metres to the north east. This settlement is also separated from the other two by the South Teign river thus giving it a territory of its own. The Lowton settlement is by far the largest and consists of 10 known hut circles, 6 of which have an internal diameter of over 7 metres. Once again working to Butler’s theory, this would give an adult population of 32 people living in a fairly dispersed pattern. If one could work on the theory that the bigger the abode the more important the person then the elite of this group lives in Hut A which is located at the very northern end of the settlement. This is by far the biggest hut and has an extra 4.8 metres of diameter over the smallest of the group, the mean internal diameter of the group is 6.7 metres. The nearest ritual monument is Hurston stone row which stand 1.22 kilometres away but this is assuming there was no connection with this settlement and that at Asacombe. The Lowton settlement would have been separated from any others to the north by the South Teign river and to the east by the Lowton Brook however because the Asacombe group is located on the eastern side of the Asacombe Brook there is no water dividing the two settlements. Is this a salient point? Finally we come to the Asacombe settlement, this consists of 8 known hut circles that have a mean internal diameter of 5.9 metres. The possible ‘house of the elite’ has a diameter of 8.1 metres with the smallest coming in at a meagre 3 metres. It could be suggested that in these huts lived an adult population of 20 people. Again this settlement is separated from others by the South Teign river to the north and the Asacombe brook to the west and if they had built on the opposite bank of the Asacombe Brook they would have been segregated to the east as well. What is unique about Asacombe is the settlements’ proximity to several ritual monuments which include, as noted above, a stone circle and a cairn. The largest hut is literally located at the south western end of the stone row, again is this significant? Well, yes in a way, on Dartmoor most of the ritual monuments of the Bronze Age tend to be at a distance from settlements, not built directly alongside them as in this case. In modern times it would be akin to building a housing estate in a churchyard, highly irreverent and one could say disrespectful of the dead. Had it been a case of the religious beliefs changing thus making the ritual monuments redundant, this would effectively de-sanctify the site and open the way for settlement building. Could it even be that the ritual monuments originally belonged to the Lowton settlement which stands about 700 metres away. Then there was some tribal conflict which resulted in the Lowton tribe being subjected to a new leadership and as a symbol of this the new rulers deliberately built over their sacred ground? 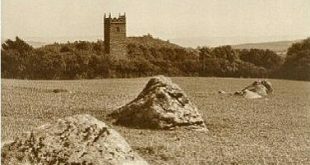 Were the two major settlements of Asacombe deliberately placed on the highest hill in the area and is there any reason why it should be surrounded by an immediate landscape literally studded with ritual monuments? Was there some kind of tribal elite living on this high vantage point for all to see, a bit like ‘look at me I’m the king of the castle’. Going back to the place-name, did it arrive from Asa’s Combe and was he one of the elite living in the mansion sized huts? Maybe this theory is a load of old tosh and Asacombe Hill was no different to anywhere else on the moor. One thing is for certain, some day all the trees will have been chopped down and then perhaps things will literally be seen in a different light. Personally I would love to think that somewhere on this hill lived a mighty chieftain called Asa, he lived in a magnificent hut that measured a spacious 8.1 metres in diameter which was located next to the various ritual monuments of his time. On a clear summer’s day he would walk the 700 odd metres to the highest point of his hill and survey the tribal lands that were his.